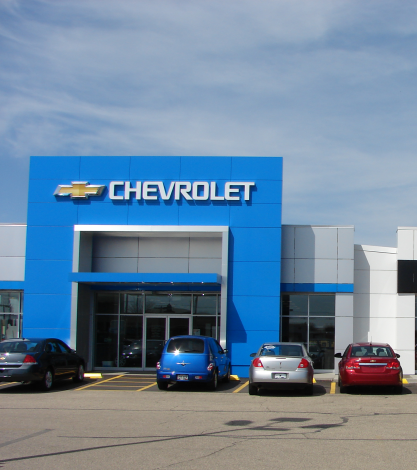 The Chevrolet re-image program was designed to ensure dealers meet customer expectations for facility design with facility brand elements consistently applied across the dealership. 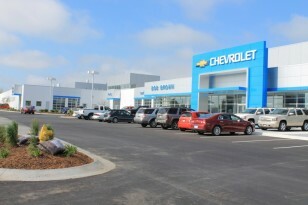 The exterior aesthetics consisted of two or more rows of silver aluminum composite panels and a 12” wide blue band at the bottom of the parapet along the showroom, as well as a modular Chevrolet entry element at the main entrance. Metal Design Systems, along with strategic partners, provided a complete turnkey solution for over 300 dealerships, providing the building components, modular entry elements, signage and installation. Utilizing our Exact+Site™ 3D laser scan service, MDSI was able to capture all the “as built” conditions in a matter of hours for each location. We then applied the design intent of the brand directly onto the model to ensure the Chevrolet brand was kept consistent from site to site. The MDSI Series 42 (Non-Progressive Gasket Sealed System) or Series 44 (Non-Progressive Drained and Back Ventilated Rainscreen) was utilized to accomplish the aesthetic look of the brand with crisp, clean lines, and quick installation in the field. Both of these systems are very adaptable to the numerous conditions existing from site to site, offering adaptability with a variety of trims, extrusions and coping features. Series 42 and Series 44 panel systems also allow for any panel to be removed and replaced should they become damaged, giving the dealership the ability to maintain their beautiful newly re-branded facility with less disruption and lower costs.